May patients often come in and ask us what cause toothaches? We always say the severity of the ache is what is necessary to look at. Do you feel sharp shooting pain in your mouth? Or maybe it is slight and tingling? Not all toothaches are the same. Many people will have a toothache throughout their life. The number one cause for toothaches is cavities. Cavities can happen to anyone at any age. You can avoid getting cavities by brushing and flossing your teeth daily. 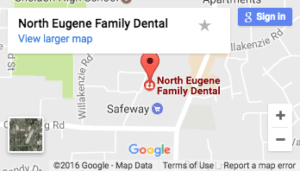 It’s also important to stay up-to-date with your dental visits, at least visiting your Eugene, OR Family Dentist twice a year. Many people ask what causes cavities. There are many factors that contribute to tooth decay and corrosion of the teeth. Your health is important, and your oral health makes a difference what you put in your mouth matters. A diet high in fat and sugar usually can contribute to some more cavities in the mouth. People who drink a lot of soda also experience more tooth decay. The best thing you can do to improve your oral health is reduce the amount of sugar that you consume. Instead eat fresh vegetables and drink lots of water. Water has a natural detoxifying effect, it can wash away food particles and bacteria that builds up in your mouth. It can also decrease appetite and decrease dehydration. If you have a toothache ask yourself when the last time you brushed your teeth was? Perhaps your teeth are hurting because you haven’t been taking care of your teeth. You can start by brushing your teeth regularly and make an appointment to see us. The second most common cause of toothaches is periodontal disease which is gum disease that can affect your over all health. It’s important to take care of your smile to prevent medical problems.